Global definitions for your account are done in the Preferences menu. The first 2 menu items are your SDK and API app tokens. Your App Token is used to initializing the TestFairy SDK. You can use the TestFairy API to directly upload builds and invite testers. For more information please read the Upload API guide. The notifications options are used to define what type of messages you want to receive about new builds, crashes and user feedback. You can integrate your TestFairy account with different services in order to customize and streamline your work processes. SMTP and Gmail: look here how to connect your SMTP email server or your gmail account (including enterprise G suite) so the emails you send from your TestFairy account will be sent from your business email and you will be able to see the sent items in your email account. Slack: see here for how to integrate your slack account with TestFairy. When you connect your bug system to the TestFairy service it creates a seamless process of reporting bugs straight to your JIRA, Bugzilla, GitHub, Trello or one of the other systems you can connect. TestFairy lets you customize the invitation email it sends. This feature is available only if you use a custom email server. 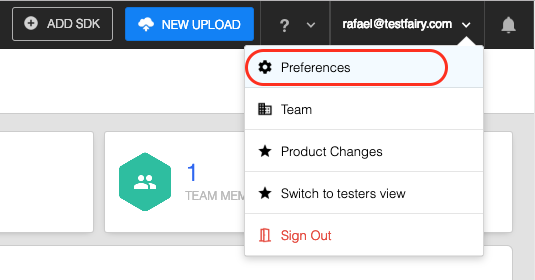 You can customize the app invitation email sent to invite testers to a specific app and the testers invite email that is used to invite testers to create a testers account in TestFairy. The email is HTML based and can use custom tags. Require user login before app download: if you want your testers to first create a tester account prior to downloading your app. This is the flow the tester will go through. Require [Google] Sign on for all users: all users will have to sign on using a google email address. This is the case when you use google email integration. Optional [after adding SAML/Single Sign-on] - Grant access to all apps to testers who sign-on with SSO - testers who sign in using your sso will have access to all apps.. Here you add the SSO metadata definitions file. When you add SAML/Single Sign-on it will contain your ID, URL and x509 certificate. First and last name of the account owner. Change your account user name. Here you will see your account invoices. Allows recording of specific users, instead of recording all user sessions. This is useful in cases where customer support teams wish to enable recording for a specific user that has a problem.